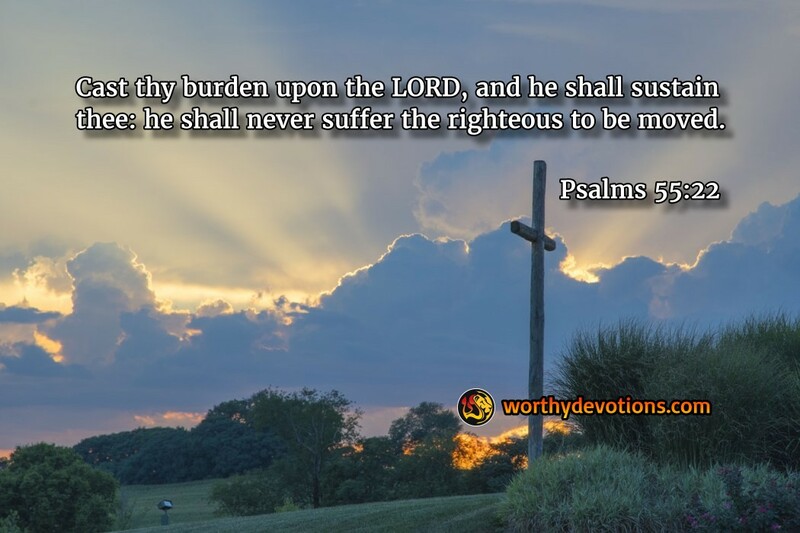 At one point during his ministry, he was deeply distressed by many burdens. As he prayed for strength to carry on, he came across Psalm 55:22 -- "Cast your burden on the LORD, and He shall sustain thee." Suddenly this truth entered his heart and he sprung to his feet and cried, "This fear-allaying truth has evaded me too long! I see it all now. If we are obeying the Lord and still run into difficulty, the heavy responsibility rests with HIM, not with us!" Then he prayed, "Lord, you shall carry all the burden! At your bidding I will go forward, leaving the results with You!" With the burden lifted from his shoulders, Hudson Taylor went on to establish a great work in China. Are you burdened today? Whatever your burden may be -- cast it upon the Lord -- He will carry it, and free you to serve Him with His peace and power! The Lord cares for you!